Make It a Green Halloween! October is finally here and as the trees transform their summer leaves into beautiful autumn hues of orange, red, yellow and gold, we not only begin to prepare for the winter months but also the coming of the holiday season. First up? Halloween! For many, Halloween is synonymous with spooky décor, creative costumes, and yes…sweet treats! Lots of them. And while we love each of these things, we don’t love the tremendous amount of waste or impending sugar overload that can accompany them. Luckily, there are plenty of ways to enjoy the spirit of Halloween without compromising our health or the health of our planet. Here are our top tips for a ghoulishly green, EEK-O friendly Halloween! 1. Participate in a costume swap: According to one study shared in Real Simple magazine, over 6,250 tons of landfill waste could be avoided (that’s equivalent to the weight of 2,500 mid-sized cars) if kids swapped their Halloween costumes instead of purchasing new ones.This startling statistic doesn’t even take into consideration adults dressing up for their own neighborhood or office parties. Avoid the unnecessary waste and check out Green Halloween’s National Costume Swap program and learn how to organize your own costume-swap party or find one happening near you. 2. Donate your trick-or-treat bounty to a candy buyback program: Candy buyback programs are a great way to get rid of extra candy and add a little holiday cheer for troops overseas! Operation Gratitude partners with dentists all over the country to pay cash or prizes in exchange for your gooey goodies. Check with your dentist or find a green dental office near you and ask whether or not the doc is hosting Halloween candy buyback program this year. Your pearly whites will thank you! 3. Be creative: Think outside of the box (or wrapper) and find kid-friendly alternatives to traditional Halloween treats, which are often full of high fructose corn syrup and can do a number on your oral and overall health. Kids love trinkets and treasures of all kinds, especially those from nature such as polished rocks, crystals and seashells. Try to avoid non-recycled plastic items! 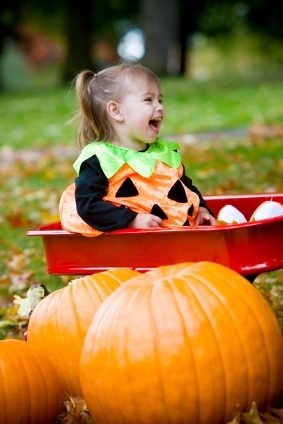 Take a look at this helpful list from Green Halloween for some fun ideas. 4. Make your own goody bag or go re-usable: Plastic orange pumpkin pails and sacks are sooo passé! There are tons of great reusable and recycled options out there that are sure to please everyone. Take a look at some of these options from ChicoBag or Envirosax, which are appropriate for all seasons! Feeling crafty? Buy a blank canvas bag and have the little ones decorate with non-toxic paint…et voila! Halloween-chic. 5. Choose fair-trade and organic candy: In the U.S. alone, we purchase nearly 600 million pounds of candy a year for Halloween. Imagine 16 BILLION fun size Snickers bars or 158 trillion Candy Corns. The vast majority of this sugar load contains palm oil, a top contributor to deforestation, and uses an exorbitant amount of resources to create, process and ship. Instead opt for a fair-trade, organic treat like AlterEco chocolate, SunRidge Farms Organic Fruit Slices, or some of these great options from the Sierra Club. Here’s to a healthy, safe and green Halloween!